A simple picture will probably explain things better than any introductory description could. 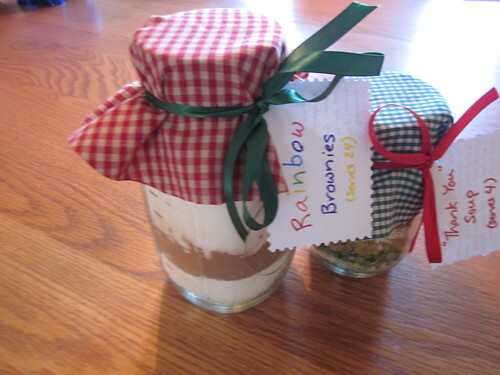 The jar on the left, obviously, is a “Rainbow Brownie” mix, to which you add just a couple liquid ingredients, pour into a pan, and bake at 350 F for 30 minutes. The one on the right is a soup mix, to which you add 6 cups of water (and, optionally, 1/2 lb. ground beef) and boil in a pot for 45 minutes (or in a crock pot for an afternoon). The nice thing about jars like these is that you can easily mix the ingredients for yourself and keep them in a jar or a baggie for future use. They won’t look quite as pretty as these jars, but they’ll certainly be functional (see below). Let’s take a peek at the contents of the two jars. In the picture above, we made a pint jar, which is a half-batch of what’s described below. That’s because we’re giving that jar to a couple with one very young child. If you want to give this to a larger family or want to ensure that the recipient has leftovers, make the full batch, as described below. 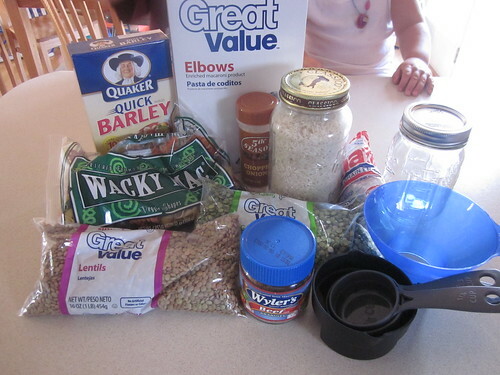 We added these ingredients to a quart jar, going right down the list. As you can see above, Joe helped with this. The finished soup jar has a nice pretty layered look to it, something very cute to put into the cupboard that’s also functional, too. 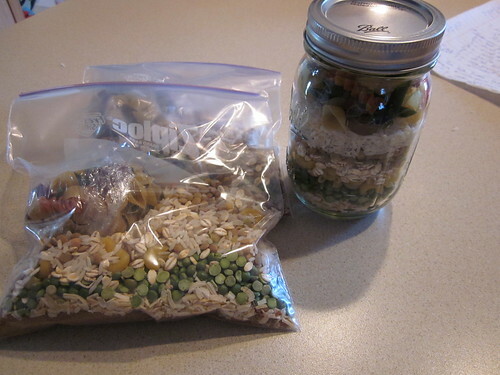 Of course, if you’d like, you can make the same mix for yourself and keep it in a baggie or a jar. We added all of these ingredients to a few baggies for our own use. A quick labeling with some identification of the contents and some instructions and we have some good meals ready to go for later this winter. 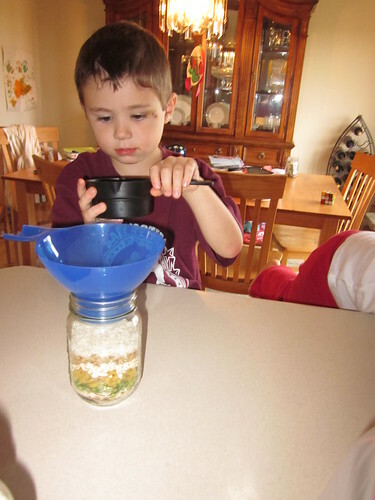 We followed a similar procedure with the brownie jar. You’ll need the following ingredients (and a quart jar, of course). 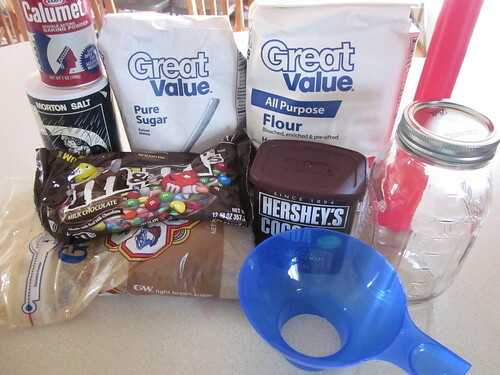 First, mix the flour, baking powder, and salt together before putting them in the jar. After that, you’re just going to be adding powdered ingredients to a quart jar. We started with the flour layer, then put the cocoa on top of that. At this point, spend some time to pack down the flour and cocoa mix with whatever you have on hand to push down on the powder; otherwise, you’ll run out of room before you can put in all of the mix-ins. Put in the sugar next, then top it with the mix-ins (pecans or chocolate chips or M&Ms). 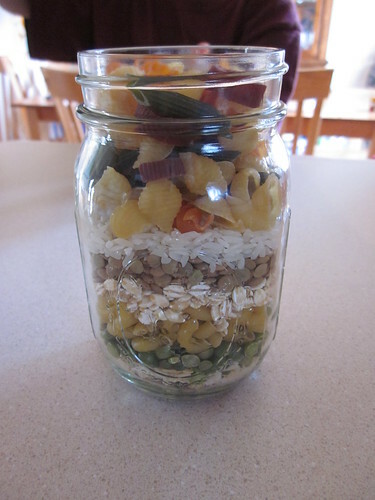 On the top of each jar, put an ordinary lid and a ring so that it can easily be opened later. 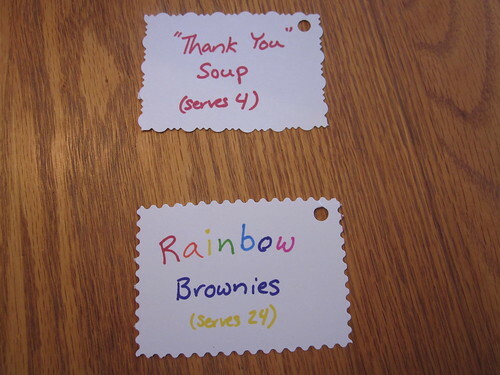 We also put a sticker on the bottom of each jar listing the ingredients (in case recipients have allergies). We also bought some bulk cloth at a fabric shop and cut it into large squares (5″ by 5″ or so), then tied this piece of cloth to the top of the jar with a ribbon. To that ribbon, we also tied instruction tags. One side describes the item, the other side explains what needs to be done. In large kettle, brown 1 lb. ground beef (optional). Remove tri-color pasta and reserve. Add rest to kettle with 12 cups water. Let come to a boil and simmer for 45 minutes. Add tri color pasta and simmer 15 minutes more. Preheat to 350 F. Grease 9″x13″ baking pan. Empty jar into large bowl and stir to blend. Mix in 1 cup melted butter, 3 eggs, and 1 tsp. vanilla extract. Mix thoroughly. Spread in pan. Bake 25-30 minutes. Cool completely before cutting. Optional but recommended: replace 1 cup butter with 1/2 cup butter and 1/2 cup applesauce. In the end, you’ve got some cute – and highly functional – gifts to share whenever you need them.